Use the Exit Interview Worksheet to interview an employee who is leaving the company about their experiences with the company. Contract Pack a few months ago and have been using it occasionally. I must say that it is a great product." This Exit Interview Worksheet is included in editable Word format that can be customized in Word or by using the included Wizard software. Why are you leaving your job? What were the most important considerations in taking a new job? Salary? Benefits? Working conditions? Promotional opportunities? Were you satisfied with your salary here? Were you satisfied with your benefits here? Does the new company offer better salary or benefits? What did you like most about your job here? What did you like least about your job here? Do you feel that you had the training and support to effectively do your job here? Do you have any changes to suggest that would make the job better? Did anyone in this company harass you, discriminate against you, or cause a hostile working environment here? How do you generally feel about this company? Is there anything this company can do to make you stay? Are there any other comments you would like to make? 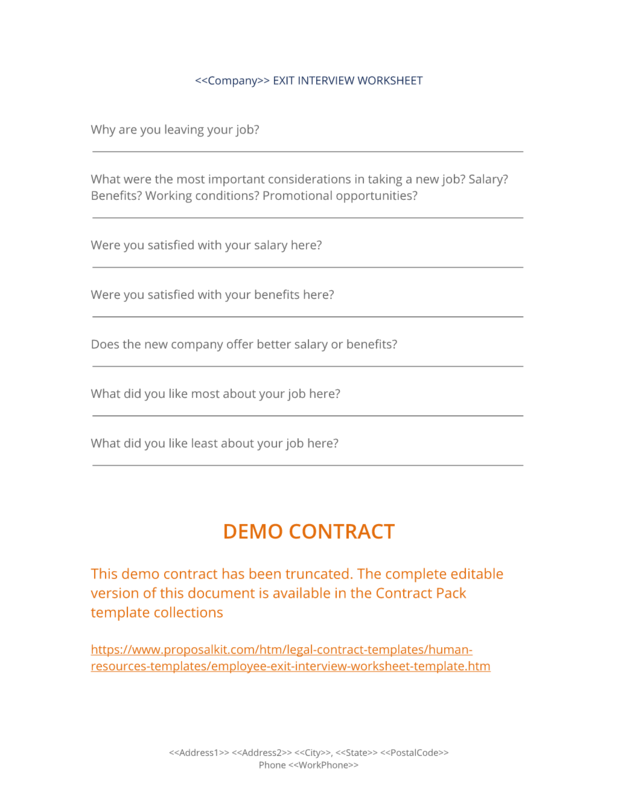 The complete Exit Interview Worksheet - with the actual formatting and layout - is available in this Contract Pack.